What contests do you have to win to get a pro card - man ? ? The committee will reply to any request for a Pro Card within few days. The committee can give / assign a special Pro Card to a competitor if they consider such an action will benefit the IBFF federation. The committee can give Pro Card to a National over all winners if the National Championships have more than 120 athletes. The committee can withdraw a Pro Card if the behaviour of a competitor is found unethical or if the competitor spoils the reputation of the IBFF federation with his behaviour. Please be advised that, pursuant to a decision taken by the IBFF PRO DIVISION COMITTEE at its annual general meeting held on October 17, 2014 in Taranto, Italy, Europe, all membership applications renewed after 1st January 2015 will, without exception, be subject to a 300.00 eur membership fee. 1. Competitor that has IBFF PRO status can compete on IBFF amateur competition and on IBFF pro competitions. 2. IBFF can take away IBFF PRO status to those competitors who act in a way that harms the reputation of IBFF. 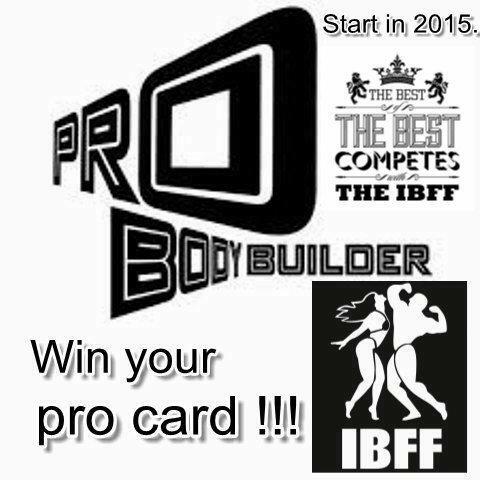 Competitor that has IBFF PRO status can compete only on IBFF pro competitions .